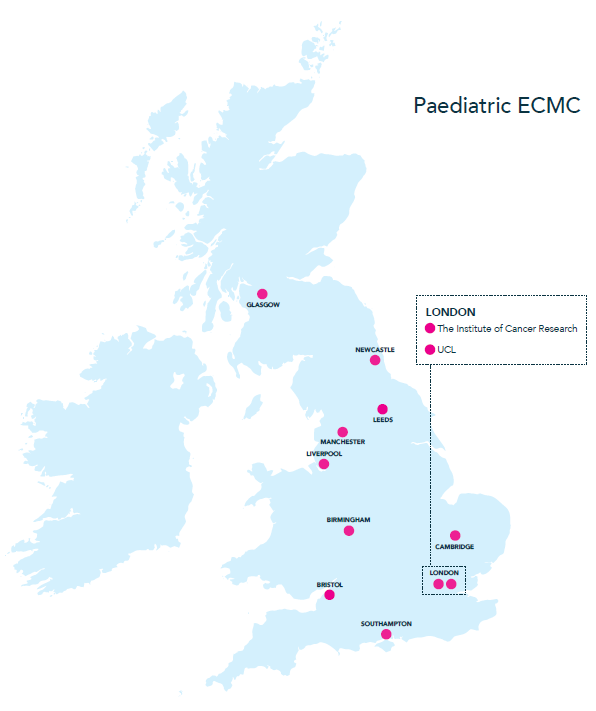 The ECMC Paediatric Network brings together clinicians and translational scientists to run early phase clinical trials in children and young people with cancer. This aims to build upon an established network of paediatric Phase I/II centres to increase the portfolio of early phase clinical trials to expand geographical access of this age group to novel anticancer agents to improve recruitment. There are 11 Paediatric Centres that form a network that functions as a single virtual centre. The Network works alongside two national paediatric biobanks, one for solid tumours, and one for leukaemia, and the vast majority of trials are run by a single specialised clinical trial unit (CTU) in Birmingham. Survival in certain types of childhood tumours remains poor, and so for these patients, new therapeutic approaches are needed based on personalised approaches and targeted agents base on the biology of individual tumours. Improved referral and recruitment of patients across the Network for three first-in-child studies, with embedded biomarker analysis, open in limited numbers of Centres globally. The work of the pharmacology group in the Newcastle Paediatric ECMC on patient samples from across the Network has demonstrated sub-optimal dosing of significant numbers of patients with 13-cis reinoic acid in the current European high-risk neuroblastoma and identified dose changes to maximise patient exposure to this agent. These findings have resulted in changes to 13-cis retinoic acid dose regimens across Europe and have been reported in the European Journal of Cancer. The Phase 1/2 study of Src/Abl tyrosine kinase inhibitor dasatinib in children and adolescents with relapsed or refractory leukaemia progressed to a Phase 2 study of dasatinib in children and adolescents with Ph+ leaukaemia with resistance or intolerance to imatinib. An important example of how the Paediatric Network is benefiting patients can be seen through the linking of the Newcastle and Glasgow Paediatric ECMCs, which has led to Newcastle becoming part of the Scottish leukaemia multidisciplinary team. This has improved the discussion of options for relapsed patients in Scotland, and allowed them to access novel therapeutic approached in Newcastle. The MAGIC initiative, led by Liverpool, is linking several parts of the ECMC Paediatric Network (the Leeds, Manchester and Newcastle ECMCs, and Great Ormond Street Hospital).